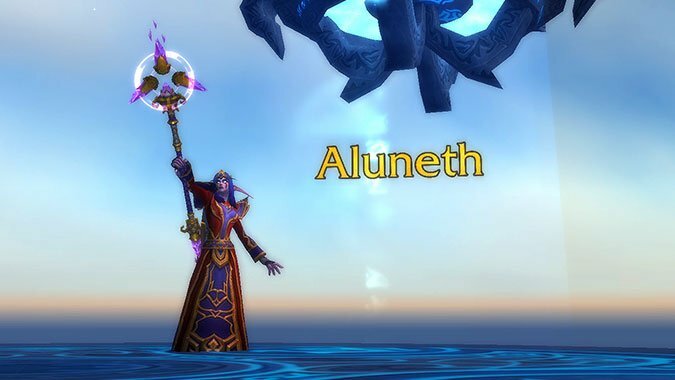 If you’re an Arcane Mage (or any Mage) who’s been itching to know more about the Aluneth questline, you’ve come to the right place! This post includes many screenshots which show in detail the entire chain from start to finish. It goes without saying that if you’re avoiding Legion spoilers you’ll want to take a pass on this post because it’s chock full of them. You have been warned! 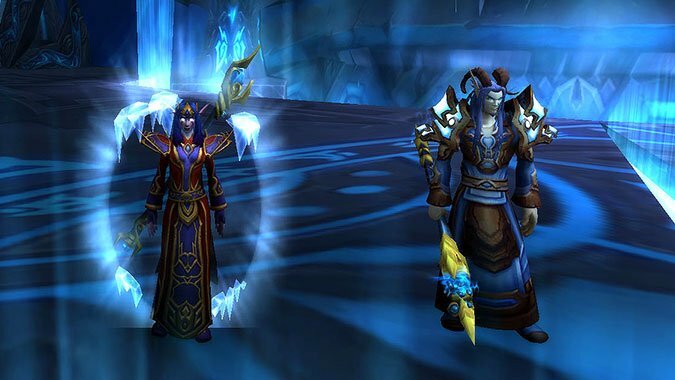 All of the Mage artifact quest chains begin the same way, but it’s kind of important to know about for context. First, you’re contacted by Meryl Felstorm, who needs help with an escaped dreadlord. 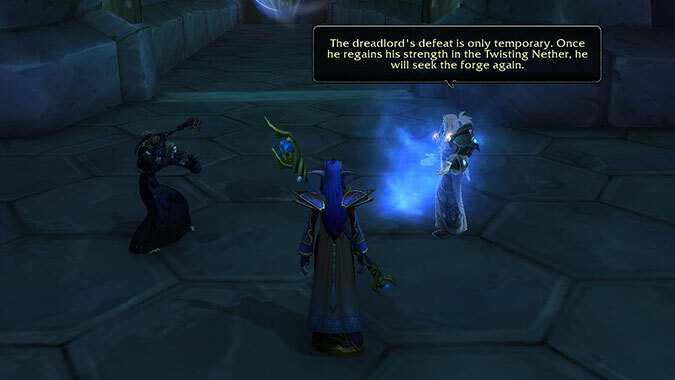 That is, the dreadlord escaped from his body where it spent years listening to all of his important Mage and Council of Tirisfal secrets. This seems like a normal problem to have, right? 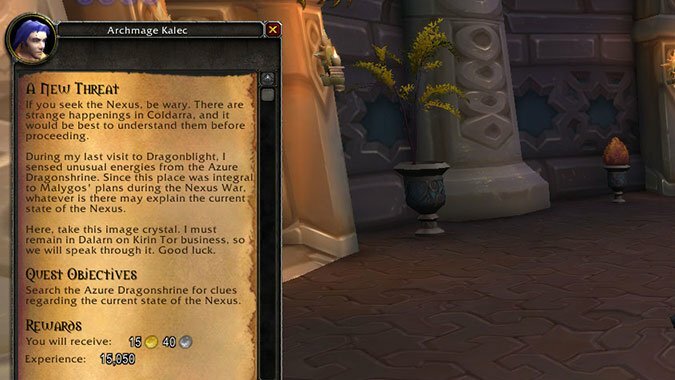 It turns out that Kathra’natir the dreadlord wants to find an ancient relic called the Forge of the Guardian. 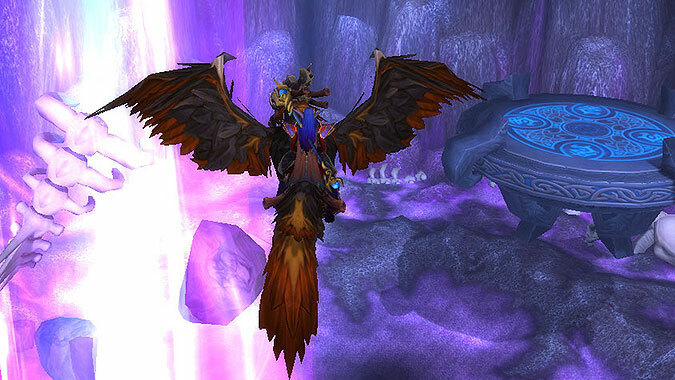 It’s essentially the vehicle which allows all of that Mage power to be infused into the chosen Guardian of Tirisfal. This was hidden in the Violet Hold, so that’s your next stop. 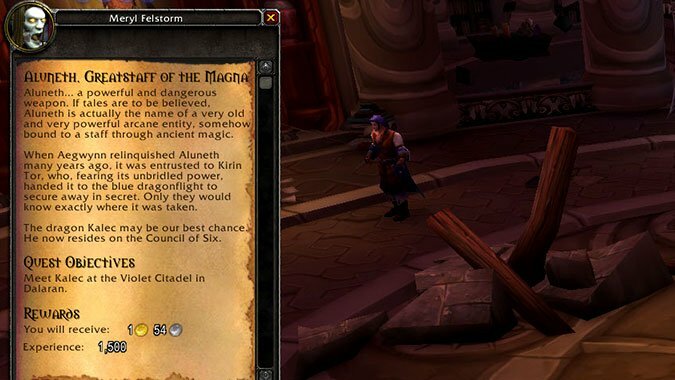 The Council hid the forge in Violet Hold after the Legion learned about it. We definitely don’t want them to get their hands on it. To make a long story fairly short, Kathra’natir is defeated after Meryl and our intrepid hero activate the power of the forge. The first Guardian of Tirisfal, Alodi, seems to maintain a consciousness inside the forge and he specifically lends us his power for a time. A short conversation between Meryl and Alodi follows during which Alodi explains that we’ve only won a temporary reprieve. 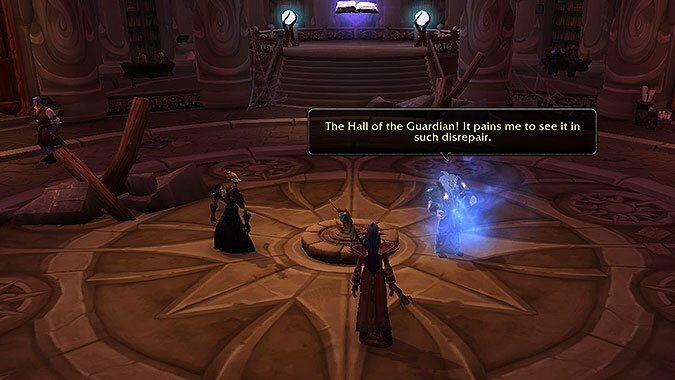 The forge has to be moved to a safe location, which turns out to be the Hall of the Guardian, and also the Mage class order hall! It starts out with some cobwebs but Meryl gets it cleaned up for you. 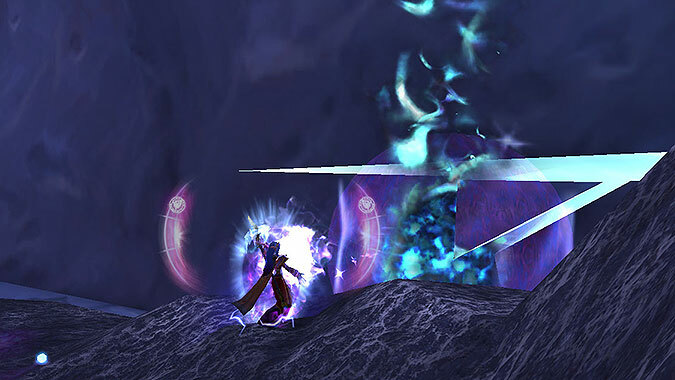 He explains the foundation of the Tirisgarde’s strength is the impressive weapons wielded by its champions and suggests that we’re going to need a sufficiently impressive weapon. At this point you can choose Aluneth and, of course, that’s what we’re going to do! Pay particular attention to how Meryl describes Aluneth here, because it’s actually completely unique to Arcane’s weapon choice. It’s the only one of the three artifacts that has some degree of sentience, similar to Dragonwrath previously. Don’t expect it to be encouraging to its wielder the way Dragonwrath did, though. The next step is to go find Kalec, because Aluneth has been in the keeping of the blue dragonflight. Before we leave, Meryl also entrusts you with three scrolls used by Aegwynn originally to bind Aluneth to her. These are also important later on. We head off to find Kalec in Dalaran. He tells us that Aluneth was locked away in the only place that could contain its rampant power: the Nexus Vault. The Nexus has been abandoned after the dissolution of the blue dragonflight, though and he has no idea what’s going on there now. This isn’t at all ominous. But wait, what’s all this stuff? Ah, of course. It’s ethereals. 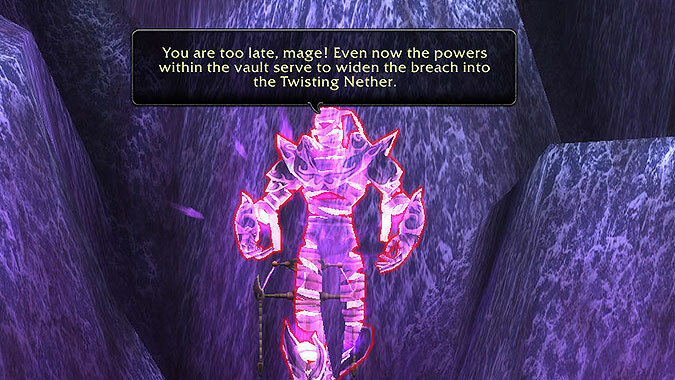 There are a few more clues scattered around pointing to ethereal involvement, and it seems as if they’re sucking void energy from the spots where Malygos messed up Azeroth’s ley lines back in Wrath of the Lich King. There’s an abandoned communication device here, and when activated, it puts us in touch with this gloating ethereal villain who is happy to explain his nefarious plans to us in a monologue. The Ethereum has control of the Nexus, and they want to harness the power of the Twisting Nether to “become void.” This adds to the ongoing mission. 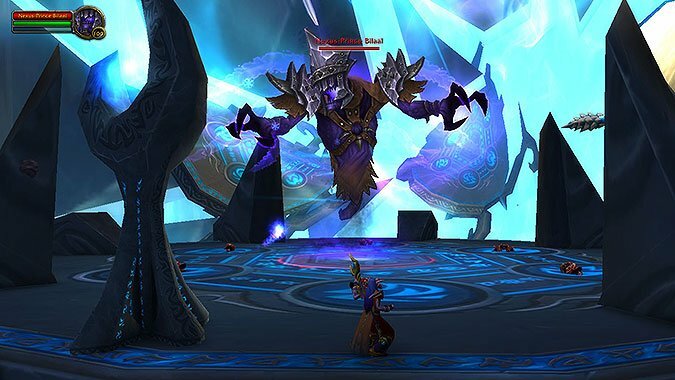 Now we’re not just trying to retrieve Aluneth, but stopping the ethereals at the same time! All in a day’s work. It’s time to head off to the Nexus itself to see what the situation is. Upon arrival we see that the Ethereum has altered the Surge Needles surrounding the Nexus to allow them to tap into the void energy. 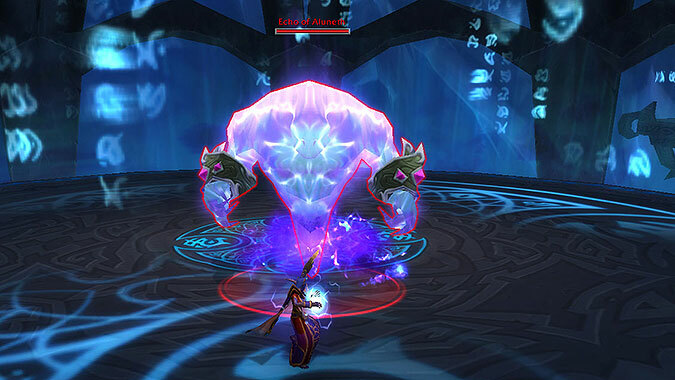 The vault inside that’s holding Aluneth has weakened and tremendous energy is breaking free. Kalec decides that we can use this energy against them to destroy the Surge Needles. After charging up on energy, we’re able to go and defeat some ethereals and destroy all three Surge Needles. At this point, Kalec realizes there’s more at stake here than just Aluneth itself. 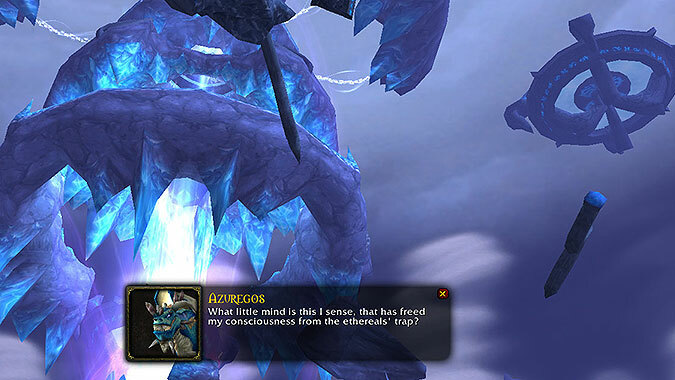 The ethereals have also captured Azuregos, who’d gone to secure the vault. He asks if we’ll go into the Nexus to free his kin while we pursue our weapon. Of course we will, because it’d be pretty rude not to help after Kalec has been helping us by phoning in all the way from Dalaran. (I’m kidding, we’re going to do it because it’s the right thing to do). Azuregos is smack in the center of the Nexus, where poor Keristrasza used to be. To free him, there are three ethereals to defeat — Scion of Ice, Fire, and Arcane. I thought the Arcane one was the toughest; I’m not sure if that was intentional. After you’ve rescued him, Azuregos realizes that going through the Nexus as a dragon is going to be cumbersome at best, so he transforms into Hot Grandad Elf instead. I’m okay with this development. We have to fight our way through the Nexus to get to the Librarium, which is where the access to the Nexus Vault ought to be. 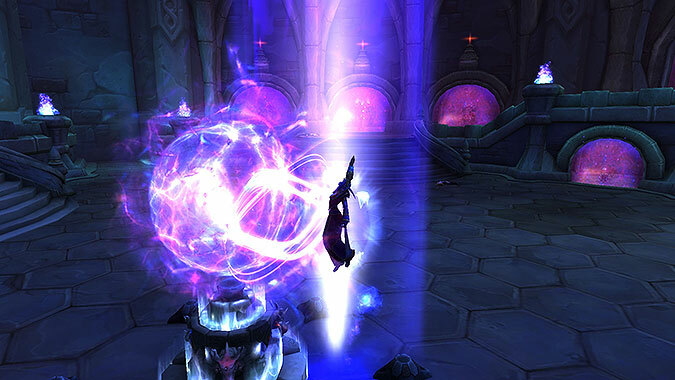 Unstable arcane energies course through the Nexus, the result of Aluneth itself lashing out at us and its prison. 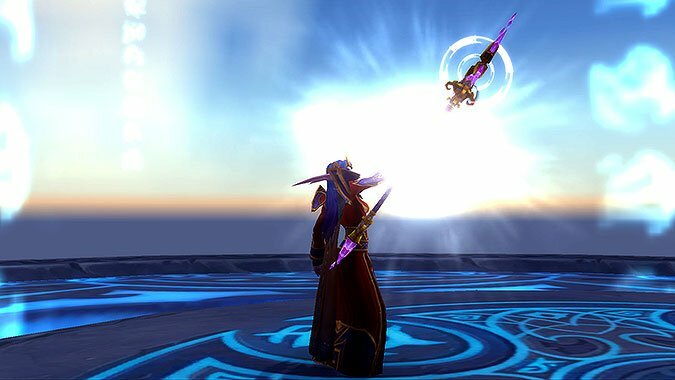 When we reach the Librarium, Azuregos finds that the vault entrance was broken when Malygos breached the Twisting Nether during the Nexus Wars. The energy surges and spawns an Echo of Aluneth on top of us. 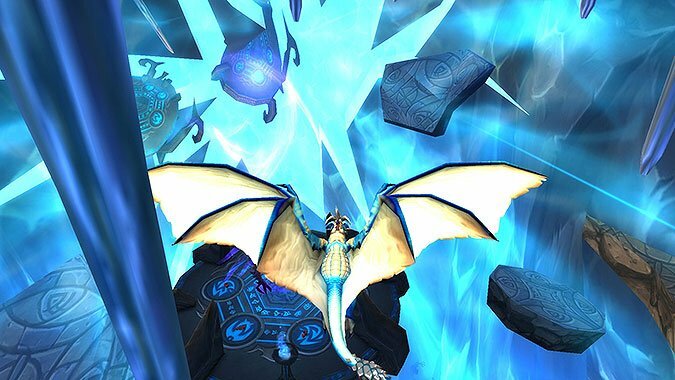 He resumes his dragon form so that we can go and take on Nexus-Prince Bilaal and reach Aluneth before this entire places collapses. We reach the middle platform and engage Nexus-Prince Bilaal. The most significant thing he does is a pushback/wind attack that will push us off the edge of the platform if we’re not careful. For this reason I found it was helpful to have Shimmer to be able to move towards the middle as often as possible. It’s also possible to use the “spikes” situated around the platform to brace yourself so you don’t get blown off. With Bilaal defeated, only one thing remains: take control of Aluneth! 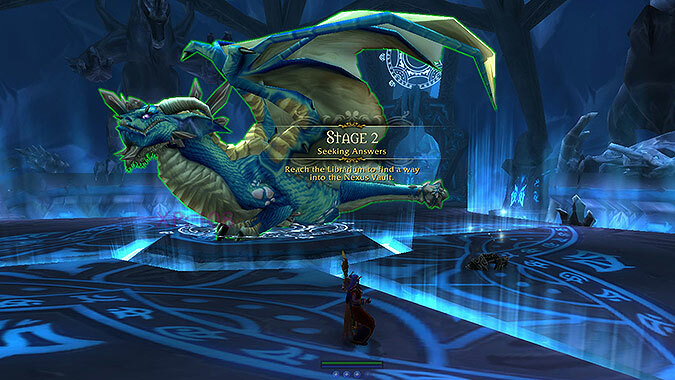 Azuregos helpfully provides a portal into the vault itself so that it’s just us facing off against Aluneth. Aluneth is not happy to see us and makes it pretty clear that its not our biggest fan. It greets us by whispering “No mere mortal can grasp the wisdom of Aluneth!” It also tells us “I will not succumb to your paltry magics!” (Spoilers: It will). 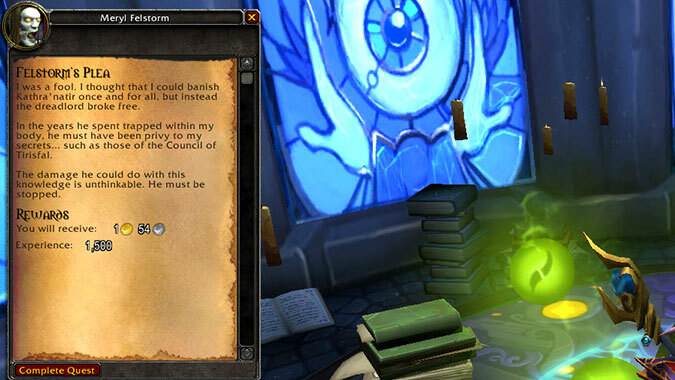 The trick here is to use Aegwynn’s scrolls which were given to us by Meryl Felstorm. They aren’t in our inventory for “use,” but instead become available as an extra action button ability each time you go inside one of these three arcane domes. The floating arcane orbs will also knock you back if you collide with them, so you have to look out for those. 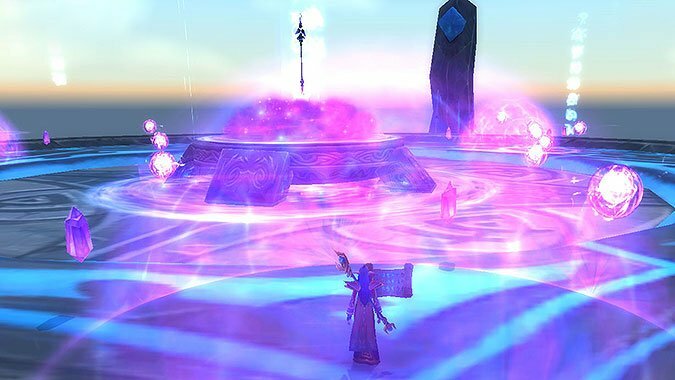 Once you’ve used all three scrolls to master Aluneth’s magic, you’re able to go and claim the artifact. What’s interesting about this is that even though you’ve managed to obtain Aluneth, it’s still not impressed. It taunts you even as you’re picking it up, telling you you’re but a child to it. Finally it says, “You foolishly think you can control this power. So be it. Come, child. Let us wreak havoc upon your foes, and I shall see what you are made of.” I suppose it’s the best beginning you can hope for from a snarky, sentient staff. 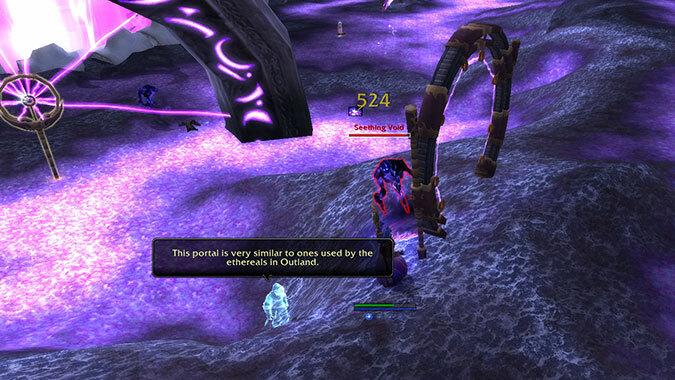 Azuregos tells you the vault energies seem to be stabilizing now and hurries you back through the portal he’s been holding open. He’s impressed you were able to control Aluneth, and says although your business here has concluded, his is just beginning. He plans to secure the Nexus so it never again falls into the wrong hands and thanks you for giving him the time to be able to do it. He sends you back to Kalecgos in Dalaran. Entering Dalaran, incidentally, prompts Aluneth to whisper to you: “Lowly Dalaran. 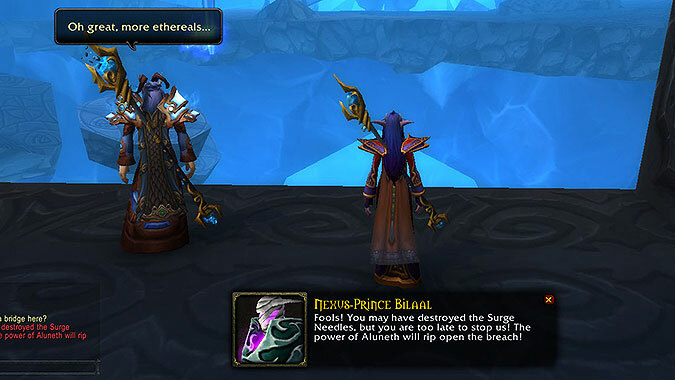 Where petty mortal politics preclude the acquisition of true power.” Kalec tells you you’re truly the hero Azeroth needs, and returning to the Hall of the Guardian and completing Meryl’s quest allows you to unlock your first artifact trait. Congratulations, you’re the proud owner of Aluneth, a powerful weapon which thinks you’re a scrub! May you be worthy of each other.